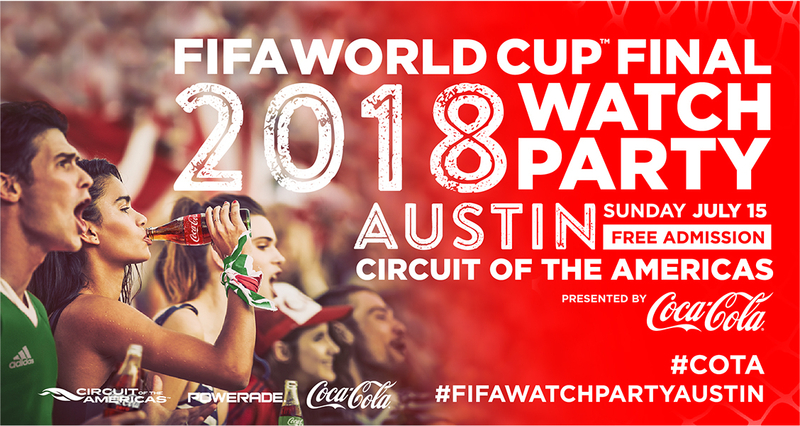 The FIFA World Cup Final is Sunday, July 15, and Austin has an exclusive invitation from Coca-Cola to view and celebrate the largest sporting event in the world. This will be the biggest FIFA World Cup Finals Watch Party in Texas, and it will be held at the 1,500 acre Circuit of the Americas (COTA), just outside downtown. Attendees will enjoy a fun-filled day of tailgate games, live DJ, food, beverages, prizes, guest appearances and multiple screens broadcasting the game, all kicking off at 8 a.m. In addition, Coca-Cola will host a day of pick-up soccer matches and an exclusive Q&A with a special guest. All of this will take place on COTA’s Grand Plaza lawn, nestled in between Turn 15 & Turn 19 of the world-class 3.4 mile raceway. Starting at 10 a.m., the FIFA World Cup Final Game will be broadcast with full audio on two giant screens flanking the Grand Plaza. Shaded picnic table seating will be available throughout the lawn. No outside coolers, food or beverage will be allowed, but bring your picnic blanket and grab an ideal spot in front of the screen to catch the action. Budweiser, the Official Beer of the FIFA World Cup, will also be onsite to celebrate along with the fans. Parking and access into the Watch Party is completely free, with food & beverage available for purchase. Powerade and Coca-Cola will be offering complimentary samples throughout the day. Gates open at 8 a.m. so come early to enjoy the festivities and stay late to celebrate the 2018 World Cup Champion with Coca-Cola at Circuit of the Americas! Entry to the FIFA World Cup Final is FREE for all guests with RSVP. Gates open at 8AM and close at 2PM. Complimentary parking is available in Lots B, C, and D. Please consult our MAPS page for detailed routes. Match begins at 10AM and will be broadcast on two massive screens with full audio. Food and beverage available for purchase. No outside food, coolers, or beverages will be permitted.